Interested in a home surveillance system without all the cable runs and special DVR hardware? Looking for a video baby monitor but don’t want to spend the $300 on a device you will only use for a few years? Or maybe you are just looking for a matrix display system for multiple cameras or information sources. If so, Blue Iris Software may be for you. 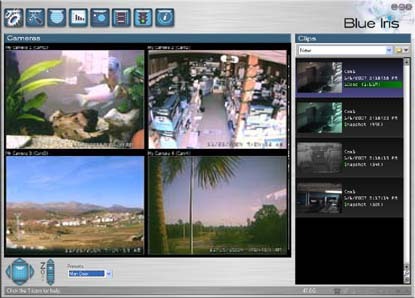 Blue Iris is a software based video recording and surveillance system that runs on a Windows PC. The system allows you to record from up to 64 feeds from almost any camera or image feed that you can port into your local computer or network. Looking to display your computer screen in another room, maybe with a camera feed or two? It can do that as well. Whether you are looking for live video recording, time lapse, or image snapshots, the software is capable. In addition, it also includes a web server with custom user access control to provide an external port to your camera feeds from any local network PC or the Internet (including your smart phone). All for just under $50 with a free15 day demo available. Blue Iris has allowed us to provide some of our clients with an affordable video monitoring system utilizing existing equipment while providing maximum scalability. With over two years of use and testing, we have been very pleased with the system from a number of different areas. First of all, software support is top notch. In a world where customer service is becoming a thing of the past, this was a welcome sight. We have utilized the system to monitor and matrix multiple internet television feeds, internet informational JPEG images such as doppler radar, current weather, traffic cameras, and more. Some of the systems we have set-up use the web server to provide as a closed-circuit system only on the local network, while others were configured with full user access control and internet access from anywhere in the world. The video attached below is a recording of Tropical Storm Lee making landfall from a Doppler Radar image feed set on a 24 hour time-lapse recording. The time-lapse was set for 1 second every 10 minutes with a new video recording starting every 12 hours. In order to post the video, we also exported it from Blue Iris to WMV and uploaded it to the web. It is also important to note that there are wireless camera options at a similar price point. However, wireless has a record of being more problematic overtime (i.e. sporadic reboots, feed lock-ups, loss of connection, etc) making them more of a burden in the long term. With wireless, you are also limited to placing the cameras where you have an wall power outlet to plug in their power cords, which can become a challenge outdoors. If you are interested in wireless, check out the Wansview ProHD NCM751GA 2MP Weatherproof IP Wireless Security Camera , it is a wireless camera worth the look. More information on the Blue Iris Software including their demo download can be found at their website listed below. And if you are in the Houston area and are interested in a video monitoring configuration, feel free to give us a call!